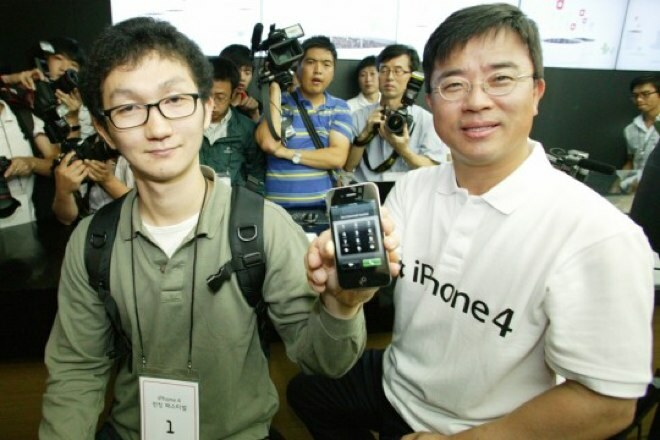 Apple’s iPhone 4S has hit 200,000 pre-orders in Korea at SK Telekom and KT, the two largest Korean wireless firms, reports Chosun. The pre-order sites were smashed as of Friday at midnight, when the phone went on sale, and crashed due to high traffic. This follows up the news that Apple’s Korean stores were sold out of the iPhone 4S within 20 minutes of the sales going live. Users then turned to SK Telecom and KT to place their orders, causing the sites to strain. The Korean telecom vendor numbers should combine with Apple’s sales to put up record numbers for handset sales in the country. Apple has been reporting record sales of the iPhone 4S, with it selling 1 million within the first 24 hours and first weekend sales of the device topping 4 million. AT&T alone activated over 1 million of Apple’s new phones in just 4 days and it broke Sprints all-time activation record for any device. The iPhone 4S was lambasted as a ‘disappointment’ at launch, but appears to be on track to become the fastest selling piece of consumer electronics of all time, possibly surpassing the reigning king, Microsoft’s Kinect peripheral.